J.A. 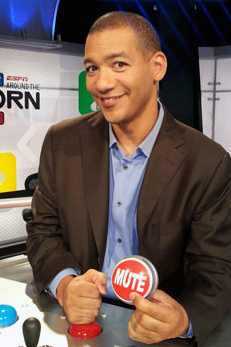 Adande (Medill ‘92) will return to campus as this year’s Homecoming grand marshal. As Homecoming draws closer, grand marshal of this year’s parade, J.A. Adande, is getting ready to return to campus. The alumnus graduated from Medill in 1992 and was the sports editor at The Daily in the early 1990s. The Current got the chance to have an email exchange with Adande, in which he shared his thoughts on his time at The Daily, which newsroom has the best view and whether he would rather see the Wildcats win a bowl game or get to the NCAA Tournament. The Current: What does the honor of grand marshal mean to you? J.A. Adande: I’m proud to have gone to Northwestern and now it feels like it’s reciprocated. It’s like a reward for all those lost weekends driving around the Big Ten and those late nights putting out The Daily’s sports section when I was in school. That’s what led to my start in the business, so this is like the culmination of a journey that began almost a quarter of a century ago. I guess that also means I’m getting old. The Current: What memories do you have about your time at The Daily? JA: First of all, it’s the best view I’ve ever had in a newsroom. The Miami Herald building looked out on the water as well, but the sports department was stuck inside, away from the windows. Looking out on Lake Michigan from the top floor of Norris made all those hours a little more tolerable. I’m proud to see what the group I worked with has gone on to do in this field; on any given day you can pick up the Chicago Tribune, Chicago Sun-Times, Orange County Register or watch ESPN and see the work of people that were in The Daily sports department with me. The Current: What was the most memorable game you covered at The Daily? JA: A few stick out: Duke coming into Welsh-Ryan Arena my sophomore year with Mike Krzyzewski, Christian Laettner and Bobby Hurley. That felt like a big deal. I remember the football team breaking out the purple jerseys and beating Illinois in the rain on Homecoming my senior year. Or beating Northern Illinois to end a losing streak that began my freshman year, went through my entire sophomore year and into my junior year. The goal posts went swimming in Lake Michigan that day. The Current: What was the best part of your experience at NU? JA: Definitely the friendships I made, strong bonds that continue to this day. That’s the one thing I miss about college: having that group together all the time. I’m looking forward to seeing some of my buddies this weekend. The Current: What was your favorite place to eat in Evanston? JA: Buffalo Joe’s. They’re still the best wings I’ve ever had … and I’ve even been to Buffalo. Also liked the apple pancakes at Clarke’s. The Current: What were your goals when you first came to Evanston? JA: I was obsessed with getting through in four years and getting that diploma. I really wanted that piece of paper. The funny thing is I don’t even have it anymore. It got lost in a move. The Current: How closely do you follow what’s going on here at NU? JA: I watch most of the football games, and when there’s some big news on campus it usually makes its way to me through email or Facebook. I was transfixed by the sad story of Harsha Maddula. I constantly checked for updates when he was missing and then trying to find any sort of answers or explanations when they found his body. The Current: What is your favorite NU tradition? The Current: It seems like there are a lot of NU alumni at ESPN. What is the relationship like between the different generations of NU alumni? JA: We’re all connected. Mike Wilbon practically raised me in this business. Mike Greenberg loves having me on the show so we can throw a double-NU smackdown on Mike Golic, who’s from lowly Notre Dame. Every time I see Rachel Nichols I remember her walking in to The Daily as a freshman and saying she wanted to write sports. Helene Elliott, who’s in the Hockey Hall of Fame, always helped me with my hockey columns when I was at the LA Times with her. I see TNT’s Craig Sager at least a dozen times a year at NBA games. And it seems like the kids that come out of school today instantly feel part of the fraternity. The Current: Which would you rather see as an NU alumus an NCAA Tournament berth or a bowl victory? JA: At this point a trip to the NCAA Tournament, just so we can say we’ve been. All of the NU alums in the Lakers media room have to get quiet around March when people point out Northwestern’s never been to the tournament. My only comeback is that at least the tournament’s been to Northwestern, host of the first Final Four.